The works of Danish artist and photographer Trine Søndergaard focus on and seek to create a visual language of reflection. Her photographs of traditional regional garments and empty rooms convey a sense of shared human experience across generations. 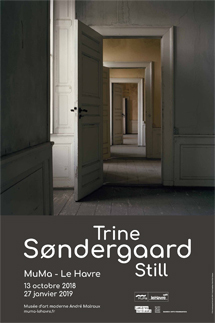 The exhibition “STILL” presents two series of photographs, Guldnakke (2012-2013) and Interior (2008-2013), alongside a painting by Vilhelm Hammershøi from the Musée d'Orsay's collections. Hammershøi's oeuvre is a source of inspiration for Søndergaard. The images in Interior clearly refer to the nineteenth-century Danish painter Vilhelm Hammershøi's paintings of rooms, with their harmonious palette of greys and fine perception and rendering of light. Gold is a universal symbol of wealth, the sublime or the divine, frequently kindling desire in the beholder. These bonnets date from the mid-nineteenth century and were popular among the wives of wealthy Danish farmers. Gilded textiles had previously been the preserve of royalty, the nobility and the church, so they were a status symbol. The highly skilled needlewomen who specialized in making them are early examples of self-employed women and were often able to support their families from their earnings. Søndergaard has previously explored both the link between this kind of female history and a specific garment and the viewer's capacity to read historical signs. The exhibition "STILL" was mounted in collaboration with the Martin Asbaek Gallery, Copenhagen with support from the Royal Danish Embassy. It will be displayed in the House of Denmark in Paris during 2019. 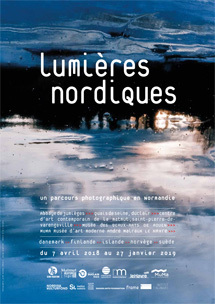 "Lumières Nordiques" aims to provide visitors with an opportunity to explore contemporary Scandinavian photography via a number of exhibitions of Nordic photographers whose work is inspired by their countries, including some new works created in Normandy by invitation. The event consists of a cycle of exhibitions in several prominent locations on the River Seine between Le Havre and Rouen. Each place will be the venue for an exhibition of the work of one or more photographers from each of the five Nordic countries - Denmark in Le Havre, Finland in Jumièges, Iceland in Duclair, Norway in Saint-Pierre de Varengeville and Sweden in Rouen. The exhibitions showcase the work of contemporary creative photographers. They centre on the photographers’ own styles and themes, and invite the viewer to take a fresh look at Nordic identity, which differs in character and influences from, say, Mediterranean photography. In terms of choice and treatment of subjects, many of these works focus on seascapes and the power of nature, while others feature interiors, portraits and atmospheres linked by a particular light, colours and climate. Certain images naturally resonate or interact with the exhibition settings and especially their landscapes. Some have been created specially for the event, with the photographers working in a particular landscape or town in Normandy, drawing inspiration from its history and artistic heritage. As well as celebrating artworks from elsewhere, "Lumières Nordiques" is intended to provide a context in which interactions between different cultures and sensibilities can take place. Gabriel Bauret, Curator, "Lumières Nordiques"